The first and foremost question is, which ones will be the perfect and coziest one? That's why I entitled it, How to Choose a Down Comforter? Down comforters are not only for cold weather. That's why before buying we would like to recommend you learn about the ultimate buying guide on How to choose a down comforter. 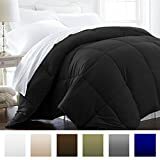 Actually down comforters come in different sizes, colors, thicknesses, warmth level, fabric style, fill power and weight. So need to confirm the best-matched one based on your habit and requirements out of this crowd. Here are few things need to keep in mind before picking a new down comforter during your shopping: Fill power, warmth and weight level, size, construction type and down type. These important things seamlessly related to down comforter. That's why we have tried to covers these things in this content aiming to answer the question: How to Choose a Down Comforter?. 0.1 The significant guide to choosing your down comforter? The significant guide to choosing your down comforter? Well, here need to discuss the Fill Power first. What is Fill Power? Actually, fill power refers the number of cubic inches the single ounce of down will fill up; the higher the amount, the higher the superiority quality for a lighter, softer down comforter. Most of the a﻿﻿ffordable goose ﻿﻿﻿﻿down comforters have 500 - 600 Fill Power TCS Down that able to provide medium soft and light warmth. Most of them come from the USA. Such as 600 US White Duck Down or 600 White Goose Down for this type quality. European Downs are higher quality goose down with plump, resilient down clusters and exceptional softer than the most competitors. 700-800 Fill Power European Downs provides high quality, exceptional loft, and warmth. 700 European White Goose Down and 800 European White Goose Down is the example of these qualities. Luxurious white European Goose Down with the exclusive large, simply luxurious, most resilient clusters, the rare collection with 900-1000 Fill Power. These downs are able to provide maximum warmth and comfort with minimal weight. You can check 900 European White Goose Down, 1,000 European White Goose Down for this level of quality. The most luxurious down comforter from select cold climate geese. Iceland, Scandinavia, and Hungarian supreme quality white European down comforters have the ability to provide the warmest level, super comfort with the lightest weight. The prize is also high in the high quality. Rare eiderdown fill is one of the examples of this quality. The temperature of your bedroom is a most important thing to choose a perfect match down comforter for you. Line up the temperature of the bedroom you live with how you usually feel there while you are sleeping. Then you should pick the warmth level according to your requirement. It's would be the perfect one for those who actually prefer the bare minimum. Super lightweight quality is the ideal comforter for warmer climates and summer sleeping. It's for room temperatures 75°F and up. These comforters are also usable all year round for cold lover users. Lightweight comforters are perfect for less warm seasons and climates than the super lightweight quality level. It's also perfect one for those who love to keep the bedroom temperature cool, specifically from 70°F to 75°F. Cold lover users can use this all year round. This level is one of the most popular levels in the down comforter market. The medium weight comforters offer year-round comfort with plenty of down fill. It's a perfect choice for the room temperatures level 65°F to 70°F. It's a suitable one for cold sleepers too. During early spring or late fall, the extra warm weight may be the cozy choice for down comforter user. It is perfect for room temperatures from 60°F to 65°F. Most of the cold sleepers love this. People who need toasty warmth during the coldest time of winters may be the perfect for Ultra Warn Weight. It is very warmest. When the temperature of your room is below 60°F, you must need something like that. You may choose goose down comforter for getting extra warm in 2019. You will get bedding for a wide variety of sizes such as twin, twin XL size, full size, queen size, king size or California king size. A comforter should be large enough to cover perfectly all of you. That's why manufacturers make down comforters in the variety of sizes. Small to large or extra-large even over-sized styles are also available. Over-sized comforters usually hang over the edges of the bed and gives you a maximum coverage. Here, you need to check the size dimensions carefully because size dimensions' are not universal. Every manufacturer has the own measurement that's why there are a variety of size dimensions. Before choosing best match down comforter, you need to decide which fabric quality you like to have besides considering warmth level and size of a comforter. There are some different quality fabric to choose in 100 % cotton. Batiste fabric is an excellent durable and extremely light in weight quality fabric. This type of fabric offers a perfectly soft feel to use and high sheen. Damask fabric is a great quality type and the price is also great. Actually, cambric is the basic weave and it has an excellent value. 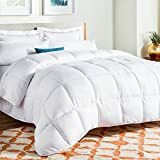 You need to be sure that you are going to buy a down comforter that has down proof and completely free from harmful chemicals. Don't forget to ask about the guarantee about the leak of down or feathers. There is a variety of stitching styles and construction available among the down comforters. Take a deep look at the illustrations below, you can see most common designs of construction and stitching. Their benefits are not same. Read details about every design to get clean conception. Actually, strips of fabric are called baffles. They are sewn between top and bottom layers of your comforter. It creates several compartments for the fill to distribute them equally. Baffle walls empower the down to expand entirely to get the maximum loft providing the highest cushion. The top and bottom layers of the comforter are nicely sewn together in a pattern like a diamond to avoid shifting of the fill. In this design, walls are created boldly around the outer edges of your comforter. It ensures the connection of top and bottom layers perfectly. The edges here add height to maximize the loft. The gusseted comforters are available in both sewn-through and baffle-box construction. It usually comes in baffle-box and box-stitch. In the designs, no 1, 2 and 3 Cross-stitches actually restrict the fill to move even a little bit. Here Karo-Step allows for some controlled movement of your comforter fill. It's a nice looking design constructed with the pattern using small circles and sew the top and bottom layers together. Like the Karo-Step design, Right-Stitch also allows the inside fill to move little around. In this design, the top and bottom layers are sewn together like the box pattern that also helps avoid shifting of the fill. It's a different looking design of stitch that sewn the top and bottom layers together in vertical or horizontal rows. Eventually, this design of construction allows the fill to move more than a box stitch. Down comforters are actually made from the super light, plumules, and fluffy clusters. That material come from the feathers of geese and ducks. Fill power is the scale to measure the quality of a down. The amount of the down per ounce defines the fill power. There is no stiff shape, hard quill or flat in Down. It is the most popular, common and used type of down. Both white and gray color goose down is available to use. The color of down has no effect on its quality. The white goose down is commonly used and popular in the market. One of the main reason is, it doesn't show through the white comforters shells. Those people who don't like to use down-filled comforters, synthetic is a great alternative material for them. As a comfort provider, synthetic has the same properties. Moreover, it can also be hypoallergenic that could helpful for allergic sulfuring people. These things you must need to know to find out the best match and perfect comforter for you. When you bring the new comforter at home, just keep in mind that it would take maximum 72 hours to expand and achieve the maximum loft and fluffiness after you unpacking it. Not only choosing, cleaning and care is also important for a down comforter. You can check this content, How to Wash a Down Alternative Comforter for a proper guideline. Don't forget to follow the manufacturer's instructions. For the best prices, just remember that the white sales naturally happen in January. So, if possible, just hold off your decision until then for grab the best deals.